I didn’t feel like mentioning my deteriorating eyesight and detached vitreouses…nor the fact that seven herniated discs and two fractured vertebrae kept me from walking for a year. Just a perky little 30-second video on being an Audible Addict. If you vote for me, I might win a new Volvo! My old one is 17 years old, so that would be like a wish come true–at last! 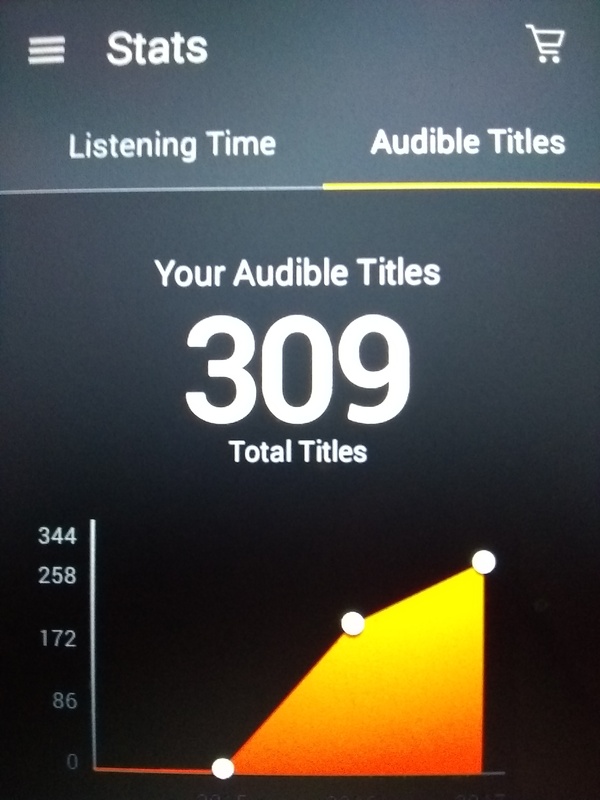 Nevertheless, I wanted to express gratitude for Audible and its huge selection of audiobooks, and not simply for the initial reasons stated. Yes, I am saving my failing eyesight for work, yet still managing to feed my voracious appetite for books. As a writer and reader, I need books the way a fish needs water. And yes, I can multitask with a book playing through my little Bluetooth speaker, leaving my hands free. Actually though, I think the most significant benefit of listening to audiobooks has been the return to literature in its original oral form. Before we developed our written orthographies, we told, memorized, and shared stories. Listening to a book forces me to slow down and pay attention to details of style and technique I might have missed as I zoom through the pages in my typical speedy way. Listening evokes the comfort of being read to as a child. I can linger over alliterative moments and taste the rhythms of speech. A good narrator makes a book even more of a multimedia experience, with the narrative, the character voices, and my visual and auditory imagination all sharp and awake and playing their parts. As a poet the moments I most treasure are when my words echo through the auditorium, and I see emotions flitting across the faces of my listeners, and feel them feeling me. This is one of life’s greatest ecstatic gifts–knowing that you are heard, and felt, and understood. It mirrors in words the unspoken ballet of physical communion. There is joy in connecting with other human beings. This is the joy that keeps me going, even in the dark and lonely and poor times, even when I am grieving the loss of love, or what might have been, or my dead babies. Without a novel playing in the background, the world can be a cruel and ugly place. Right now I am staring at eviction if a job contract doesn’t materialize in a matter of days. I am fighting to keep my electricity on. Nights are long and sleepless, or distorted by nightmares as I mourn the lost possibilities of youth. I miss my dead husband. I miss my American Express card. I miss my organic garden. Entropy hit me hard this year! So these are the deeper reasons why I love audiobooks.